While studying abroad in Florence, I fell in love with Baci Perugina candies. I first opened one of the sparkly blue foiled wrappers at a mercato near my host home and was overcome by the dark chocolate coated mix of creamy and whole hazelnuts. The Baci (“kisses” in Italian) chocolates have been around since the 1930s, and have been symbols of affection for many Italians (each chocolate is wrapped with a tiny love note inside). For Valentine’s Day, I was inspired to build a Baci-themed sundae. 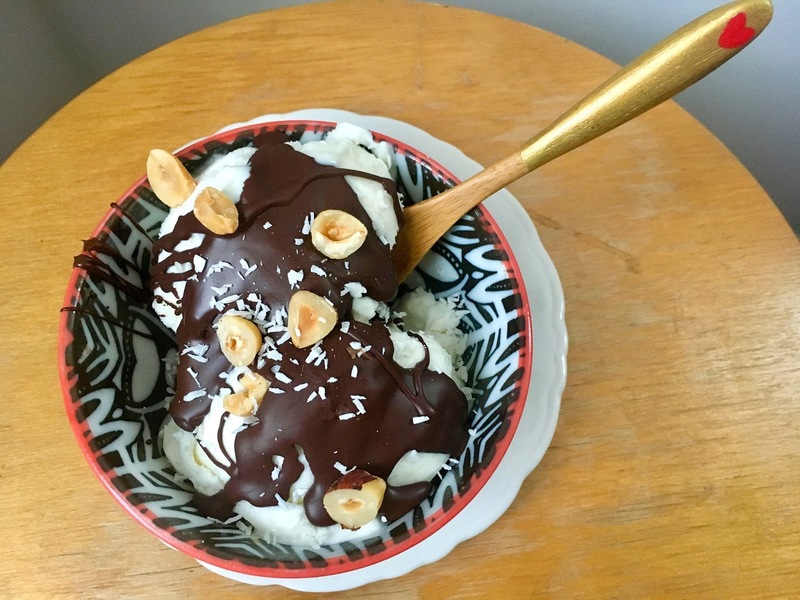 I recently discovered the craze of DIY chocolate shells by simply combining a chocolate bar and coconut oil. The way the melted chocolate turns into a crackly shell when drizzled over ice cream is sort of magical. 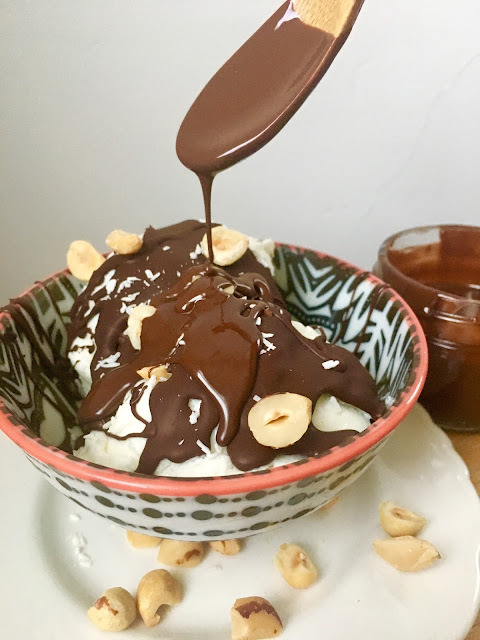 I added a bit of flare to my chocolate shell with some hazelnut liqueur and generously drizzled it over rich vanilla ice cream with a sprinkling of toasty hazelnuts and a subtly sweet crunch of shredded coconut on top. Crack through the shell and enjoy! Place the chopped dark chocolate and coconut oil in a bowl and microwave on high for 30 seconds. Stir in the Frangelico and then microwave again in 10 second intervals until the chocolate is smooth and glossy. Scoop your desired amount of Vanilla Ice Cream into 2 bowls. Top with a generous drizzle of the melted chocolate sauce on top of each. Sprinkle the toasted hazelnuts and shredded coconut on top of the chocolatge. By then the chocolate should be almost firm. Crack in with your spoon and enjoy. Makes 2. If you have leftover chocolate sauce, just pour it into a mason jar, cover tightly and refrigerate. When ready to use again, just reheat in the microwave and spoon. Or! Slice up some fresh bananas, dip them in the chocolate and place them in the freezer for a poppable dessert!